Until this week it was supported by temporary pillars and hydraulic jacks. Now the 1,000-ton roof structure no longer needs them, it’s hanging safely above the future stadium. It’s one of the most unique stadiums of the next World Cup. And that stadium underwent a major operation over the last several weeks as its roof has now become self-sustaining. Like many in recent years, the Yekaterinburg stadium has roof based on two major rings. The outer compression ring is larger, more massive and is the main one, based on eight permanent concrete pillars. The inner one is significantly thinner and was until recent days supported by temporary scaffolding. On top of that scaffolding 14 hydraulic jacks were installed, lifting it up, just above the designed height. 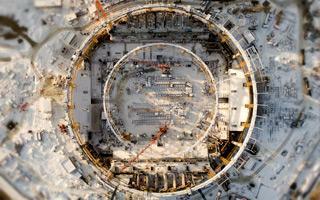 Since November 15 the two rings were being connected with 54 radial beams which will eventually become the base for the roof’s cladding. In early December all beams were installed, paving the way for removal of temporary supports. On Wednesday all of the 14 jacks were simultaneously lowering their height, eventually dipping by 16 cm and leaving the inner circle stretched in its eventual position. It’s a very sensitive operation, during which all progress was monitored constantly. The inner ring and all beams together weigh 1,000 tons, according to the general contractor Sinara Development. Once entirely clad, the roof will resemble a circular funnel, becoming instantly recognisable.